This achievement of winning two gold medals at different Olympics, then coaching the side that won another gold medal makes Carroll one of the great Australian Olympians. He joins a golden group led by Shirley de la Hunty (nee Strickland), the brainy, brilliant athlete from Western Australia who won acclaim as the first Australian athlete, male or female, to win a gold medal at successive Olympic Games. In the case of Carroll, his gold medals as a rugby player came in successive Olympics when rugby was played. His involvement as a winning coach in 1924 puts him near to Dawn Fraser’s achievement of winning the 100m freestyle swimming event for women in three successive Olympics, 1956, 1960 and 1964. The International Olympic Committee named Dawn Fraser as its female swimmer of the century for this achievement in 1999. The eminence and honours, rightly, piled on Shirley de la Hunty and Dawn Fraser provide an appropriate context in which to measure the Olympic exploits of Daniel Carroll, rugby’s greatest Olympian and one of the pre-eminent, if unfortunately almost unknown, figures of the early decades of the Olympic movement. 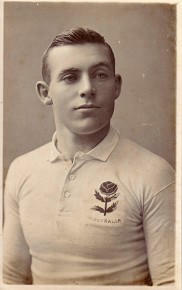 Daniel Carroll’s first Olympic experience was in 1908 as a member of the successful Wallaby side that defeated Cornwall for the gold medal at the London Olympics. In the eight-try rout of their opponents, Carroll, a fast-as-a-flash winger, or “good finisher” as we would call him these days, scored two tries, both of them runaways. 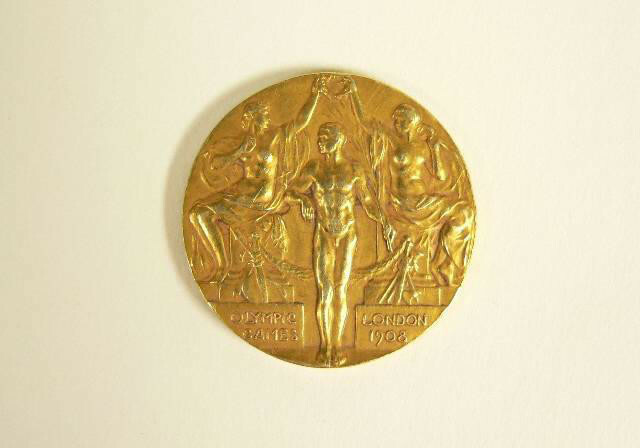 The gold medal won by the Wallabies was the only gold medal won by an Australasian side at the 1908 Olympics. Because there were New Zealanders in the 1908 Australasian squad (but none in the Wallabies) the official Australian Olympic Committee records do not acknowledge this triumph on its list of gold medals won by Australians or an Australian team. Possibly Cornwall was put off its game by the abnormal setting – the London Olympic complex at Shepherd’s Bush. John Mulford at the ARU Archives researched the ground the Olympic final was played on some time ago. He claims the ground which was “unparalleled” in international rugby: “The match was played on an area alongside the Olympic swimming pool, which measured 110 yards in length, the same length as a rugby field. Along the side of the 110-yard cement swimming pool was placed a long line of netting to catch flying balls and maybe, stray players sent tumbling into touch. The netting almost bordered the touchline. Large mattresses were spread along the rim of the pool to prevent injuries to falling players. Two men with long poles on which were attached nets fished successfully for numerous balls which went over the top of the netting. To risk a dunking or an injury by playing the running game provides evidence of a strong commitment to the clever, ball-in-hand game the 1908-9 Wallabies aspired to and often achieved. It set the template for future national sides in Tests, and now the sevens sides which has competed at the Rio Olympics. There was no rugby at the 1912 Olympics. When rugby came back on the Olympic competition list again in 1920 at Antwerp, Daniel Carroll won his second gold medal as a player-coach for the successful American team. Then in 1924, at the Paris Olympics, Carroll coached the successful American rugby team. There is no official recognition for this achievement. Successful coaches, then and now, do not receive Olympic medals with the teams and athletes they have coached. If the film Chariots of Fire is historically accurate, as it probably is, this differentiation between athletes and coaches reflects the official and out-dated thinking within the Olympic movement that coaches are equated with a professional approach to sport that is somehow unacceptable to the Olympic ethos. However, other premier sports team events – like the English FA Cup final and the Rugby World Cup tournament – now honour coaches with a gold medal along with the winning side. There is the practical difficulty, in an era when individual athletes have a number of coaches, of the IOC having to present numerous gold medals at every medals ceremony. The gold currency would obviously be devalued if this was allowed to happen. 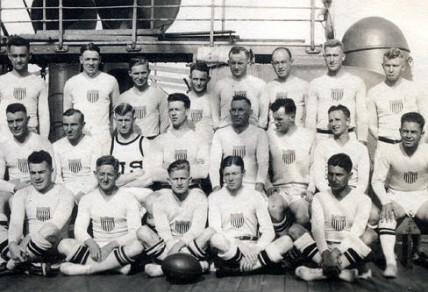 At the 1920 Antwerp Games, the USA was represented by a team from California (made up of players from the universities of Stanford, Santa Clara and California) which defeated the hot favourites France 8-0 in the only rugby match of the Games. Their coach was Daniel Carroll, who also played in the side. The British rugby unions refused to send teams as it was out of season for them. Romania and Czechoslavakia offered teams and then withdrew after being thrashed by France in their continental tournament. 1924 was the last time rugby featured at the Olympics before the game’s restoration in the sevens rugby mode at the 2016 Rio Olympics. The disgraceful behaviour by the French crowd, which was an affront to the Olympic spirit, was the death blow to rugby as an Olympic sport. In four Olympics, there had never been more than three countries competing and only two truly national sides, France and Australia, actually took part. The international aspect of the rugby competition of these three Olympics was slight at best. Now that rugby is an Olympic sport, after a hiatus of 92 years, this claim is now open to a challenge. My money, though, is on Pollard’s prediction. This quest for Olympic gold started for Daniel Carroll at St Aloysius’ College in Sydney, where rugby was a passion among the boys and their teachers. Carroll then went on to Sydney University, another hotbed of rugby. He studied dentistry. After strong performances for NSW against Queensland and an Anglo-Welsh side, he was selected for the 1908 touring Wallabies; the youngest player in the team. On the way back to Australia, the Wallabies travelled across America before taking a ship from San Francisco back to Australia. They played several matches against American college sides, with Carroll being an outstanding player. 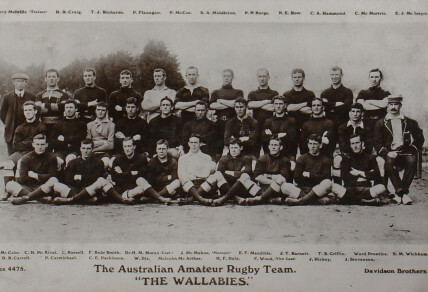 Most of the 1908 Wallabies, with the notable exception of the team’s captain Dr Herbert Moran, who stayed in Edinburugh to get his qualifications as a surgeon, defected to the new rugby league code which started in Sydney in 1908. Daniel Carroll was another exception. He stayed with rugby union, even though he was overlooked by the Australian selectors for the three Tests against New Zealand in 1910. He was back in the Wallabies in 1912, having been selected for the Australian side which toured California and defeated an All-American side 12-8. The aura of Olympic gold still surrounded the Australian side, even though Carroll was the only Olympian. The team was dubbed by American newspapers as “the world champions of rugby,” a reference to the 1908 Olympic victory. Daniel Carroll remained in California, enrolling at Stanford University where he studied for a degree in geology. He played for America in 1913 against the All Blacks in a Test won by New Zealand 51-3. He served as a lieutenant in the American army in the First World War and was wounded in 1918. He recovered sufficiently from his wounds to play for the Australian Army side in the Kings Cup tournament in 1919. We come to one of the great mysteries, one of several, about the life of Daniel Carroll. Why did he return to the United States at the end of 1919 and not return to Australia? Harry Gordon refers to Carroll being the financial backer of a Hollywood film in which “Snowy” Baker starred. There is a certain charm in this story, as Baker competed successfully in 29 sports, five of them internationally, with one of the sports being rugby. Baker represented Australia against the touring British rugby side in two Tests in 1904. In 1908 Baker competed for Australia as a boxer. Some members of the touring Wallabies watched this contest, so Carroll may well have watched as Baker out-fought J.W.H.T.Douglas, later a Test cricketer, in a final only to lose as per the referee’s decision. A number of newspaper reports claimed that the referee was Douglas’ father. After this home decision, Baker went to Hollywood, where he starred in silent movies and became a director of the Riviera Country Club at Santa Monica. Daniel Carroll, like Baker, lived out his life at this time during the 1920s in the USA. Harry Gordon’s claim of a business connection between the two men is a good story. Unfortunately, it is an false story. Clearly, ‘Movie’ Dan Carroll was not ‘Rugby’ Daniel Carroll. It is only a surmise, but I think the amateur nature of American rugby probably had a great appeal for Daniel Carroll. And that this appeal led him to take up a place at Stanford University. Later he decided to settle in the USA. Why did he return to the United States at the end of 1919 and not return to Australia? Remember that Dr Moran and Daniel Carroll were the two most prominent Wallabies from the 1908 side who did not go over to the rugby league game. Daniel Carroll was the youngest member of Dr Moran’s Wallabies. He went to the same school as Dr Moran and to the same university. It is not fanciful to claim, therefore, that Dr Moran’s strong views on the necessity of amateurism in rugby influenced Carroll’s thinking on the issue. And rugby in the USA, especially at private universities like Stanford, was amateur in every aspect of its practice and organisation. This is conjecture, like so much about Daniel Carroll’s life. The ARU Archives do not answer this question. But they do give tantalising glimpses of further matters about Daniel Carroll that will probably never be fully resolved. Another clipping from an Irish newspaper published in 1992, written by David Guiney, goes through the familiar details of Carroll’s rugby career. At the end of the article comes the punchline, however. Guiney quotes the research of Dr Bill Mallon, of North Carolina, “the most meticulous of America’s Olympic historians,” who states categorically that Daniel Brendan Carroll was born on 17 February 1892. Guiney pointed out that Carroll’s birthday is usually stated as 17 November 1888, the date given by the rugby historian Jack Pollard. But Dr Mallon’s “emphatic findings” was based, apparently, on records preserved at Stanford University and US Olympic records. Not so fast. The ARU archives have a birth certificate for Carroll that gives 1887, not 1892, as the year of his birth and Flemington, Melbourne, as the place of birth. If this certificate in the ARU Archives is accurate, as I think it probably is, Daniel Carroll would have been 21 in 1908, young but not the prodigy that Guiney suggests he might have been. Birth certificates at the time were moveable feasts. My guess is that when Carroll enrolled in Stanford University in 1912 he moved his age forward four years to be in the same age group, or closer to it, of the under-graduates playing in the rugby squad. The article went on to mention that he “played his last game of rugby in 1921, when a pick up side visited British Colombia.” Carroll, therefore, remained a rugby missionary to the last. A successful missionary at that, for British Colombia has become a heartland province of Canadian rugby. Other documents in the ARU Archives on Daniel Carroll relate to some correspondence conducted by his niece, Patricia Doohan of Five Docks, in Sydney, in January 1998, to the US Army Reserve Personnel Command. She was intent on tracking down the whereabouts of the Distinguished Service Cross won by Carroll during the First World War. The letter noted that Carroll had married Helen Warden from Great Falls, Montana, in 1927. The couple had one son, Daniel, who had died. Helen Warden Carroll died in 1941. Spiro is a founding writer on The Roar, and long-time editorial writer on the Sydney Morning Herald, where he started a rugby column that has run for nearly 30 years. Spiro has written 12 books: fiction, biography, politics and histories of Australian, New Zealand, British and South African rugby. He is regarded as one of the foremost writers on rugby throughout the world. Image Credit: All images are Copyright AAP Australia, unless otherwise noted.